A cover of a set of polyforms is a shape (or set of shapes) into which each member of the set could fit. Mostly I’ve looked at problems involving minimizing the size of a cover. This problem goes the other direction. Between these solutions, we see some patterns emerging. 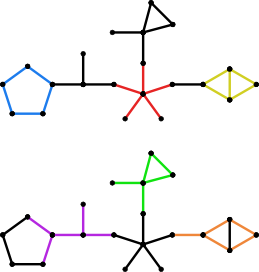 Certain polyforms are in some sense distinctive: they have features that do not occur in other polyforms in the set. This makes it easy to make a large cover that includes exactly one copy of them. Other polyforms end up serving a connective function. 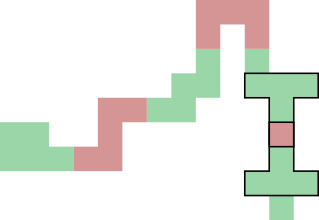 For example, there are quite a few occurrences of the L pentomino in the first figure, so removing a cell will never make the cover cease to include an L. By using a few pentominoes as many times as possible in this connective function, more pentominoes are left over to occur singularly. In some cases multiple polyforms that occur only once are forced to overlap, so we don’t get their full number of cells to add to the cover, but we do get a few. This is shown with the outlined hexiamonds above. In the case of the pentominoes, we have one cell where two T pentominoes overlap; since these are the only two T pentominoes in the figure, the cell can’t be removed from the cover. Problem #25: Find maximal irriducible contiguous covers of anything and everything! This problem ought to yield interesting results for any kind of polyform you can throw at it. One final note: It was slightly unfortunate that I chose the word “cover” to represent a concept in polyforms when it already had an unrelated meaning in graph theory; it’s even more problematic now that I’m using graphs themselves as polyforms. It appears that in graph theory, the appropriate term is “common supergraph”. I could use “common superform”, although one problem is that polyforms, unlike graphs, are generally not allowed to be disconnected, and for some problems (though not this one) we want sets of polyforms that aren’t connected to each other. Perhaps “common superformsets” in that case, as ugly as it sounds.